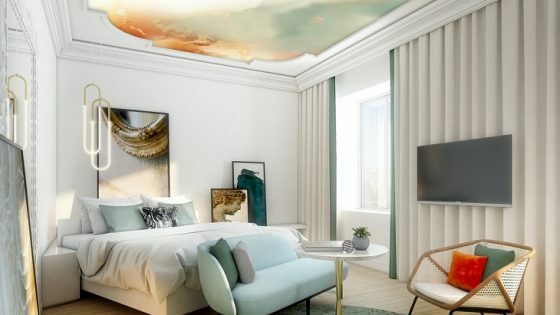 Hilton Imperial Dubrovnik, situated just above Dubrovnik old town, was originally built in the 1890s and went on to serve the great Mediterranean cruise liners docking in the city in the early 20th century. Then called ‘The Grand Hotel Imperial’, with a French Riviera feel and the glamorous cachet of an international clientele, the hotel was a roaring success for many decades, but, during the Yugoslav war, it was shelled and then used to house refugees. The hotel was subsequently brought back to active life in 2005, and most recently was renovated under the watchful eye of design house Goddard Littlefair. 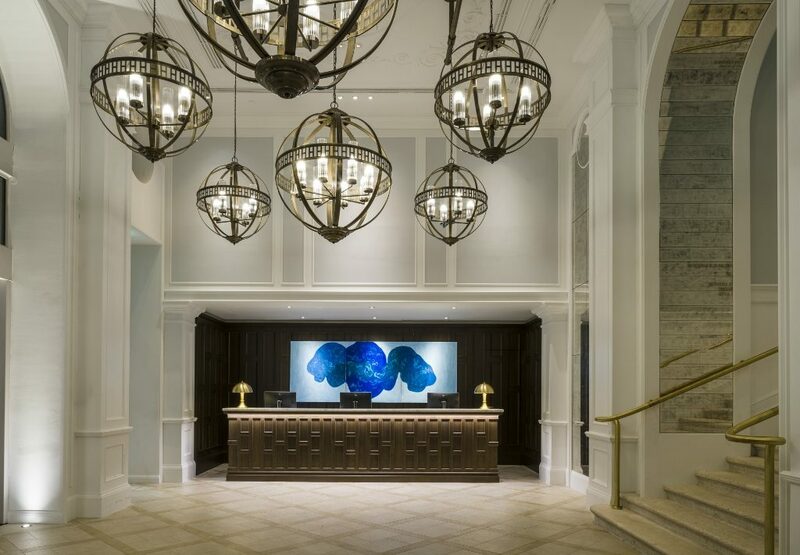 Goddard Littlefair was initially commissioned towards the end of 2016 for a phased set of redesign works, with the first two now completed and including the reception and lobby, The Lobby Lounge, The Imperial Bar, The Executive Lounge, all connecting and guest-room corridors and all of the hotel’s 149 standard and executive rooms and nine suites. A refurbishment of the hotel’s existing restaurant, Porat, on the lower-ground floor, will follow in late 2019. 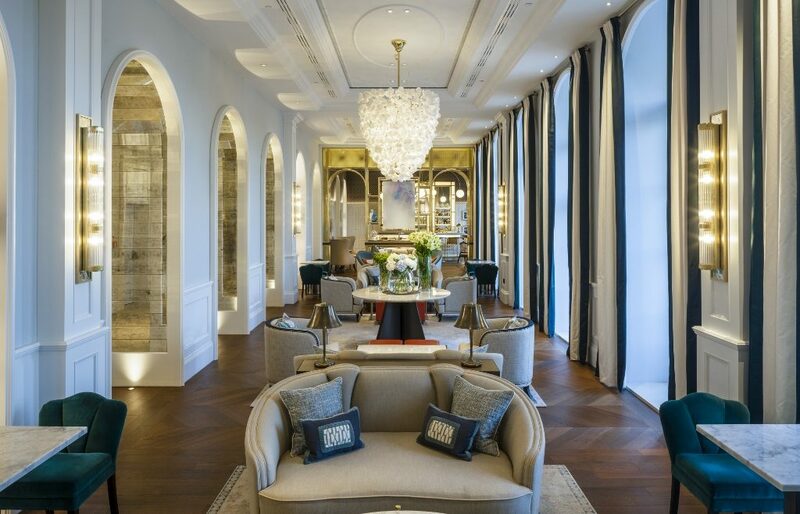 Guests enter via a metal revolving door into a stunning, double-height reception, with tall, arched windows and cool ceramic flooring in a bespoke two-tone diamond pattern, created by Goddard Littlefair and inspired by the old stone streets of the city. The reception is spacious, soothing and calming, so that guests relax instantly, especially during the intense heat of the summer season. The visitor’s eye is immediately taken by a spectacular central chandelier, made up of eleven, sculptural, globe-shaped and antiqued brass pendant lights, hanging from chains in rows of three on antiqued brass rods. Each individual pendant light within the chandelier houses seven fluted, ribbed glass tubes, concealing the bulbs, with the ribbed glass treatment used matching seven bespoke vertical wall lights in the reception’s waiting area. The feature light was designed by Jana Novakovic, Interior Designer at Goddard Littlefair and was manufactured by Croatian lighting company Dekor, who worked on most of the lighting on the project. The scheme’s overall lighting consultant, especially focusing on architectural lighting, was DPA Lighting Consultants. A bespoke, three-person reception desk is to the left of entry. The desk features a Carrara marble top and dark-stained timber panelling to the front, matching the wall panelling behind, with sculptural brass desktop lights by Dekor at each end. Behind the desk, set within timber-panelled wall surround, is a triptych of artworks by Croatian artist Antonia Čačić, specially-commissioned for the project by the scheme’s art consultants ARTIQ. The 3m-long abstract triptych incorporates a palette of soft hues inspired by the colours of the Dalmatian coast. Two lighting features immediately take the eye, one at the centre of each area. First, a bespoke chandelier in The Lobby Lounge, inspired by 1950s bathing caps, has cascading white porcelain petal shapes set on a brass framework and was made by Imagin. 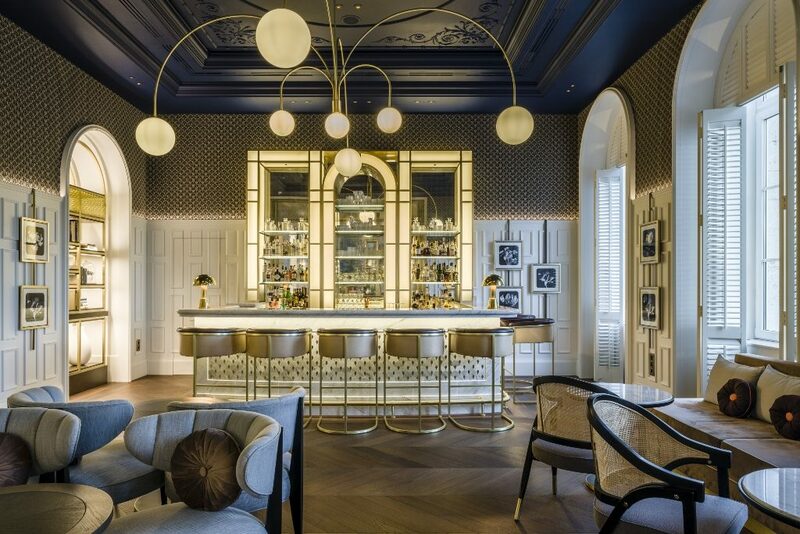 Secondly, The Imperial Bar meanwhile features a bespoke, six-armed chandelier in brass with spherical opal glass shades, designed by Goddard Littlefair and manufactured by Dekor. Wall lights in the space, with ribbed, cylindrical glass surrounds are identical to those in the reception waiting area. The ceiling in The Lobby Lounge area is painted white with new added decorative mouldings. The right-side wall is painted a pale shade of blue, as are the inner arches of the French doors that line the wall and open out on the terrace. Pole-hung curtains line the French doors in off-white, with a blue leading edge. The spaces feature three zoned seating arrangements, demarcated by individual rugs in blues and whites with a touch of coral, in a take on an antique Persian rug, set on top of timber chevron flooring that runs through the entire space. The three rugs were designed by Goddard Littlefair and made by Hotel Designs Recommended Supplier Brintons. The two end ones are identical, whilst the central one is subtly different. Each seating zone features a table, with a Carrara marble top and either fine brass legs or a more substantial dark-timber pedestal, and each has a different seating arrangement. Chairs at both the end-of-room set-ups are scoop-back armchairs in a blue-grey velvet with a woven pale grey fabric back, whilst the central chairs are all in grey with a contrasting dark blue piped edging and antiqued brass studs. 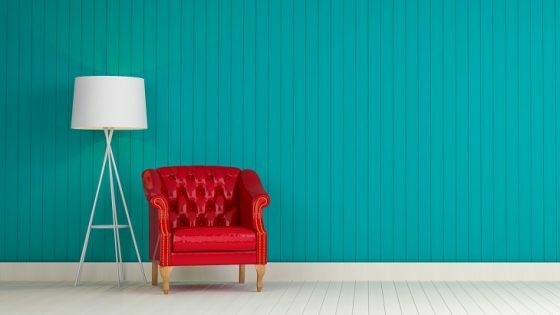 Sofas are in upholstered in a linen fabric, whilst scatter cushions are either in blue with contrast piping or else in blue or rust, introduced here in small doses for contrast, with a central textile-design panel. A number of higher tables for dining line the inside wall of the space, in Carrara marble and brass, with peacock blue velvet-upholstered ‘shell’ design chairs with ebonised timber legs. The Imperial Bar has a pronouncded deco feel. Located at the far end of the space, the bar is announced via a demarcating, stand-out brass surround screen, featuring brass shelving and fretwork panels set within its side arches and across its top section, where LED lights are also concealed. The screen was manufactured, along with all joinery, mouldings, case goods and furniture on the project by Internova. Dark timber detailing links the screen to the dark timber used for the furniture legs. The brass screen was also specially-designed to house a spectacular art piece – a second commission by Croatian artist Antonia Čačić, which sits at the centre of the screen and is in fact a triptych once more. Two of its three sections sit within the screen, with one facing each way, with the third at the other end of the space, to the rear of The Lobby Lounge. Further artwork in the bar area includes a series of 12 specially-commissioned monochrome photograms of local flowers, printed as negatives and arranged on unique, vertical-rod brass picture rails. The ceiling in The Imperial Bar is painted blue, for added drama and a moodier feel. The windows in the bar all have classic, white-painted shutters at their sides, for a subtly different feel from The Lobby Lounge. The bar also has its own table and chair arrangements with a more silky, cocktail feel to the furniture including a ‘love seat’ sofa, banquettes by the windows and small, round scatter cushions in gathered brown velvet with a trim and central large button either in the same brown or contrasting orange piping. Immediately beyond The Lobby Lounge and The Imperial Bar is the 88 sq m Executive Lounge, a further long and slim space, with entry through a double door. Hilton grades its rooms as standard, executive or suites and The Executive Lounge is for the exclusive use of guests who have booked executive rooms or suites. Essentially, rather like an airport lounge, this space offers a quieter area for guests, who can to use the space all day long and have breakfast here in the morning for example or make use of the complimentary afternoon wine and cheese served here. The Executive Lounge features a refurbished white ceiling and applied mouldings to the walls, with inset panels in a rattan wall covering from Phillip Jeffries. Flooring, for the upper two thirds of the space, is an inset carpet with a timber outer layer and brass trim from Ulster Carpets. Two gilded mirrors at the far end are by Water Gilders, with a small salon-hang arrangement of art between the mirrors, once again curated by ARTIQ. Bespoke tables run along the far end and down both sides of the room, with table tops featuring two different designs in Carrara and Nero Marquina marble, with ebonised timber pedestals. Bespoke seating includes three sofa seats below the antiqued mirrors in a peacock-blue velvet with ribbed scroll backs, with chairs opposite featuring a pale blue leather seat pad, a dark timber frame and a cane back. Seats accompanying the tables down the sides are in a dove grey with an ebonised timber frame and scatter cushions feature fabrics from Tissus d’Hélène. Curtains on the outer side of the room are full-height in an off-white with a blue leading edge, featuring the same design used for The Lobby Lounge. A long, thin island credenza runs down the centre of the space, with timber ribbing and brass detail shadow gap, a Carrara marble top and integrated timber trays, accessorised by a small terrarium of succulent plants set beneath bell jars, as well as a number of books and geometric objects of interest. Table lamps here have a brass stand and ribbed ivory shades. Armchairs to either side feature a dark timber frame and caramel leather upholstery, whilst small accompanying incidental tables have a Carrara marble and timber top with criss-cross brass and bronze legs. Above the central credenza is the room’s major lighting feature – a four-part brass ring chandelier with crystal elements and inset LED lights, bespoke-designed by Goddard Littlefair and made by Northern Lights. The hotel features an Imperial Suite, together with eight other suites and 149 executive and standard rooms. Linking corridors are inset-carpeted with timber borders in light oak and carpet runners, with a bordered bespoke design in a subtle colourway running from greys to varying shades of blue, so that it seems to fade at the border, made specially for the project by Brintons. Walls are in a pale off-white wall covering from Muraspec. Room numbers are announced via bespoke wall lights in a brass finish, with layered bronze plates announcing the room number via a cut out number in the front plate, visible against the second plate thanks to a subtle shadow. These were made to Goddard Littlefair’s design by Dekor. The design feel of all the rooms is light and fresh, with classical clean lines and a refined and elegant colour palette of blues and silvers, plus the sparing use of pale pinks. Flooring is a natural light oak, supplied by a local company in Dubrovnik and arranged in a herringbone pattern. Each room features a bespoke Axminster rug from Brinton’s, with two used for the suites. The rugs in the suites are in a pattern that suggests the Middle East, with a whipped-edge border and the colour palette inverted from one to the other in blues, turquoises and ivories, with a touch of gold, whilst the standard room rugs have a more abstract, floral pattern. In the guestrooms hang a combination of prints by Raul Perčič and another local artist, Branka Ridicki. Hanging squarely above the bed, Branka’s paintings imagine townscapes in abstract composition and were selected for their success in capturing the feeling of Dubrovnik’s winding streets and undulating roof-scapes. Photos and prints of Dubrovnik centre on the sea and seaside life, with blues and oranges giving way to some hints of orange. The pictures hang in pairs with brass picture lights above, whilst the suites feature four works of art each. The beds feature full-height panelled headboards with the panels arranged in a single ‘bird’s beak’ pattern, with a blue-painted frame and upholstered in a soft gold silk-linen. The bed linen is all in white and the bedside tables alongside are oval-shaped, with a small inset drawer and open shelf, in dark-stained timber with a timber top and drawer, along a laminate body in grey with a linen texture and timber plinth. The bedside lights are fixed to panels and are in a geometric leaf print on linen with antiqued brass, made by Dekor. A floor light has a metal base and is finished in bronze and a softly-curved geometric four-section shade in ivory linen. Some rooms alternatively feature a fully-metal, slightly shorter floor light with a demi-globe rounded head. 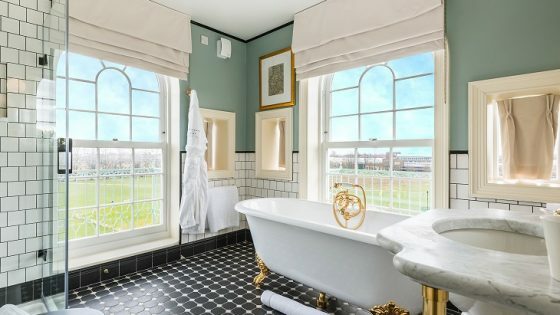 The hotel bathrooms were also lightly refreshed in the scheme, with new wall-lights, mirrored panels and decorative mirrors with brass frames and leather-hooked top detail. Circular dining tables/desks are in timber with a bell-shaped solid wood pedestal and additional gilding at the pedestal neck. The minibars are rectangular and panelled with chamfered edges, finished in dark-stained timber, together with a lacquered, low-sheen turquoise finish, with circular pulls for the drawer handles in a dark metal. Furniture in the rooms also includes an armchair and, depending on the room, a mix of other items including a stool, chaise or bench. The chaise, where present, is upholstered in a textured grey fabric with a ribbed back, a bolster and scatter cushions, which are made up of a variety of silk and linen materials with either geometric or abstract prints with a deliberately ‘worn-in’ look to the textile pattern. The bench is in a pinkish blush faux leather with tufted buttons and piping details, whilst the stool is in a turquoise faux leather with a turquoise top and piping and a base upholstered in a sandy colour. The armchair is upholstered in sky blue velvet, with ribbing to the inside of the back with a double-layered rear detail. 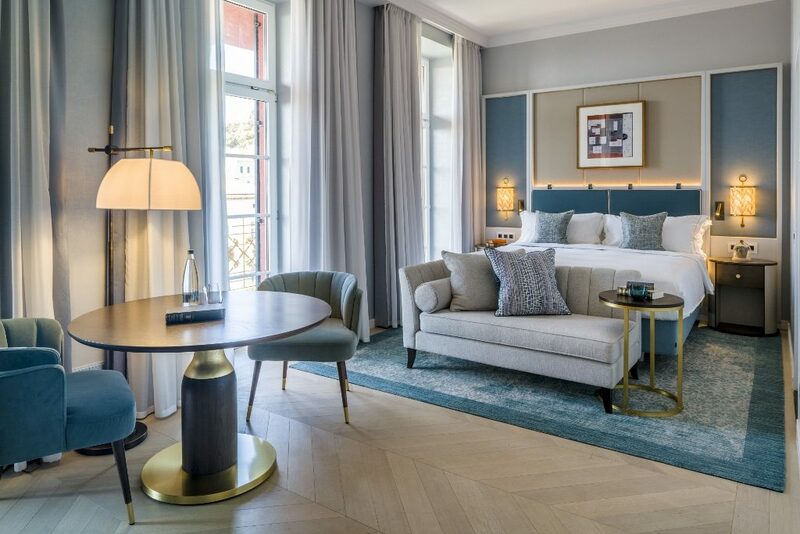 For this and other suites, the design treatment links to the standard rooms, with subtle differences, including a marble-print fabric for the wall-lights, for example, and headboards with a padded chevron treatment in a light blue faux leather and a brass trim between the upholstery and the framing timber surround. Curtains in the suites uses the same fabric as the wall lights, coupled with white sheers. All suites have applied moulding and panelling featuring a pale grey wallcovering and a white paint surround. All the suites also have sofas, upholstered in a very light off-white linen-type material with arms that splay outwards and a long and loose back cushion. Armchairs in the suites are slipper-style. upholstered in duck-egg blue velvet with a contrast trim. Bedroom armchairs are curved with vertical piping detail to the interior of the back panel that looks like ribbing and are upholstered in a grey woven material, whilst a rectangular ottoman features a turquoise faux leather top and fabric sides that match the textile used for the armchair. Lighting for the suites includes four-armed chandeliers, suspended on a chain, with a linen shade. A table lamp has a faux-leather wrapped brown base, a linen shade and a contrast trim to the top and bottom in dark brown. A coffee table has a Carrara marble top and timber legs, whilst two side tables are black-lacquered demi-lunes. Bedside tables are in a linen-effect laminate with brass legs and handles and a timber trim.